When I first saw the book, A Meal with Jesus, listed on Tim Challies top book list I knew I wanted to read it this year. 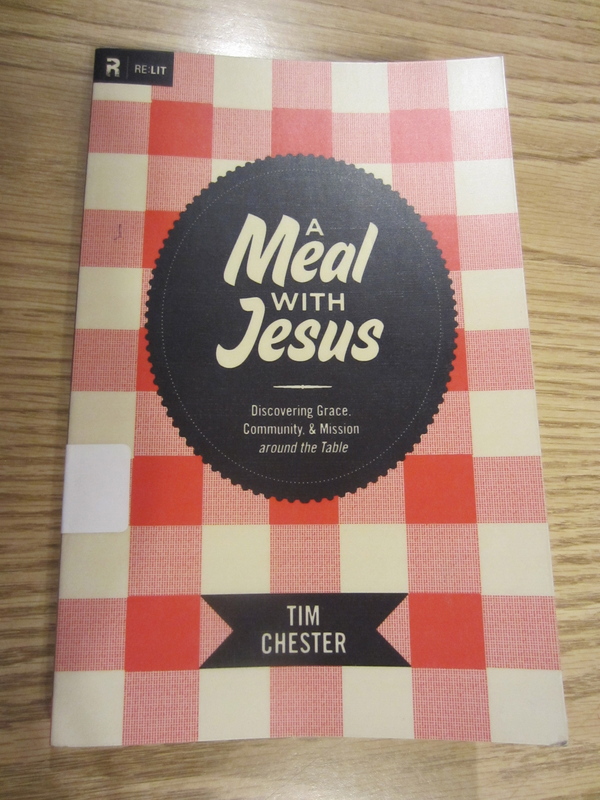 The full title of the book is A Meal with Jesus: Discovering Grace, Community, and Mission around the Table, written by Tim Chester. The title pretty much sums it up, but I’ll divulge some things that I learned from reading it. This book is about food, Jesus, us, and others. Food is something everyone of us needs, so it is a great way for us to connect with anyone. We can come together with our brothers and sisters in Christ and commune with each other and our heavenly Father. We can invite those who aren’t of our faith and live out God’s love by nourishing their bodies and souls, fulfilling the great commission. I loved this book. I really want to buy it, so I can read it again and highlight all the great content. I also would love to have it to lend it out, because I think every christian should read it. This book was especially good for me as a housewife. I know that my title is not looked high upon in this world, yet God can use what I do to further His kingdom. Since I stay at home and spend a lot of time in my kitchen, what a great opportunity to use my gifts to feed the body as He feeds the soul. I feel like we do an okay job at sharing meals with our christian family, but the challenge is bringing in non-believers into our sheltered life. I’m anxious to see where God takes my family and I as we discuss and live out this calling. In this day in age we spend more and more time corresponding on the computer. It would do well for us Christians to be different and invite our friends and neighbors over for a face to face meal, in our own homes. I encourage you to read this book and apply it to your life. I haven’t heard of this book, but after reading your review, I’m adding it to my wish list. Jesus sure spent a lot of time eating and just hanging out with people. Why shouldn’t this be true of us too? Great review! Thanks, Melissa! It is a very good book. I hope you enjoy it! Pingback: Journey to a Healthier Me : Motivation #3 – Average Housewife – Tales of an imperfect woman.